Now, we can make a bigger machine from smaller ones (h = f + g, h = f * g, etc.). The derivative rules (addition rule, product rule) give us the "overall wiggle" in terms of the parts. The chain rule is special: we can "zoom into" a single derivative and rewrite it in terms of another input (like converting "miles per hour" to "miles per minute" -- we're converting the "time" input). And with that recap, let's build our intuition for the advanced derivative rules. Onward! Ah, the quotient rule -- the one nobody remembers. Oh, maybe you memorized it with a song like "Low dee high, high dee low...", but that's not understanding! We have a rectangle, we have area, but the sides are "f" and "1/g". Input x changes off on the side (by dx), so f and g change (by df and dg)... but how does 1/g behave? Chain rule to the rescue! We can wrap up 1/g into a nice, clean variable and then "zoom in" to see that yes, it has a division inside. m changes by dm, contributing area dm * f = ? We turned m into 1/g easily. Fine. But what is dm (how much 1/g changed) in terms of dg (how much g changed)? How does this work? We get the common denominator: for 1/3 and 1/4, it's 1/12. And the difference between "neighbors" (like 1/3 and 1/4) will be 1 / common denominator, aka 1 / (x * (x + 1)). See if you can work out why! The difference is negative, because the new value (1/4) is smaller than the original (1/3). So what's the actual change? Why is the derivative negative? As dg increases, the denominator gets larger, the total value gets smaller, so we're actually shrinking (1/3 to 1/4 is a shrink of 1/12). Why do we have -1/g^2 * dg and not just -1/g^2? (This confused me at first). Remember, -1/g^2 is the chain rule conversion factor between the "g" and "1/g" scales (like saying 1 hour = 60 minutes). Fine. You still need to multiply by how far you went on the "g" scale, aka dg! An hour may be 60 minutes, but how many do you want to convert? Where does dm fit in? m is another name for 1/g. 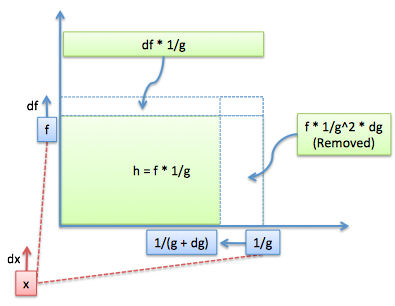 dm represents the total change in 1/g, which as we saw, was -1/g^2 * dg. This substitution trick is used all over calculus to help split up gnarly calculations. "Oh, it looks like we're doing a straight multiplication. Whoops, we zoomed in and saw one variable is actually a division -- change perspective to the inner variable, and multiply by the conversion factor". Using your intuition, you know it's the denominator that's contributing the negative change. which means, in English, "e changes by 100% of its current amount" (read more). The "current amount" assumes x is the exponent, and we want changes from x's point of view (df/dx). What if u(x)=x^2 is the exponent, but we still want changes from x's point of view? This confused me at first. I originally thought the derivative would require us to bring down "u". No -- the derivative of e^foo is e^foo. No more. But if foo is controlled by anything else, then we need to multiply the rate of change by the conversion factor (d(foo)/dx) when we jump into that inner point of view. The derivative is ln(x) is 1/x. It's usually given as a matter-of-fact. When we're at x=10, we're growing exponentially at 10 units per second. It takes roughly 1/10 of a second (1/x) to get to the next value. And when we're at x=11, it takes 1/11 of a second to get to 12. And so on: the time to the next value is 1/x. is mainly a fact to memorize, but it makes sense with a "time to grow" intepreration. Time to test our intuition: what's the derivative of x^x? Approach 1: Rewrite everything in terms of e.
Any exponent (a^b) is really just e in different clothing: [e^ln(a)]^b. We're just asking for the derivative of e^foo, where foo = ln(x) * x. We wrote e^[ln(x)*x] in its original notation, x^x. Yay! The intuition was "rewrite in terms of e and follow the chain rule". Remember, deriviatives assume each part of the system works independently. Rather than seeing x^x as a giant glob, assume it's made from two interacting functions: u^v. We can then add their individual contributions. We're sneaky though, u and v are the same (u = v = x), but don't let them know! It's the same as before! I was pretty excited to approach x^x from a few different angles. By the way, use Wolfram Alpha (like so) to check your work on derivatives (click "show steps"). Question: If u were more complex, where would we use du/dx? Imagine u was a more complex function like u=x^2 + 3: where would we multiply by du/dx? We're multiplying by the "du/dx" conversion factor to get things from x's point of view. Similarly, if v were more complex, we'd have a dv/dx term when computing v's point of view. Look what happened -- we figured out the genric d/du and converted it into a more specific d/dx when needed. We set "df * dg" to zero when jumping out of the infinitesimal world and back to our regular number system. Think in terms of "How much did g change? How much did f change?" and derivatives snap into place much easier. "Divide through" by dx at the end. With practice, ideas start clicking. Don't worry about getting tripped up -- I still tried to overuse the chain-rule when working with exponents. Learning is a process! The derivative of f can be seen from x's point of view (how does f change with x?) 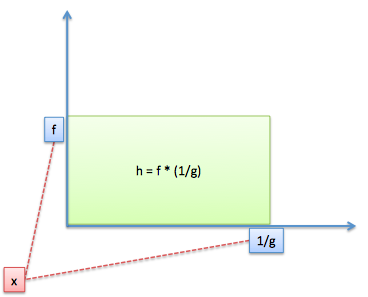 or y's point of view (how does f change with y?). It's the same idea: we have two "independent" perspectives that we combine for the overall behavior (it's like combining the point of view of two Solipsists, who think they're the only "real" people in the universe). It's a bit of the chain rule -- we're combining two perspectives, and for each perspective, we dive into its root cause (time). This is the gradient, a way to represent "From this point, if you travel in the x or y direction, here's how you'll change". We combined our 1-dimensional "points of view" to get an understanding of the entire 2d system. Whoa.